SmartVault for Intuit Lacerte and ProSeries sets the print settings to save PDFs to SmartVault, which allows you to print tax returns and other documents directly to SmartVault. When you print from Lacerte or ProSeries, you can store the PDF in SmartVault. When you print a tax return, Lacerte and ProSeries allows you to print multiple copies, such as the Filing Copy and the Client Copy, and stores these tax returns in SmartVault as PDF files in their respective folders. 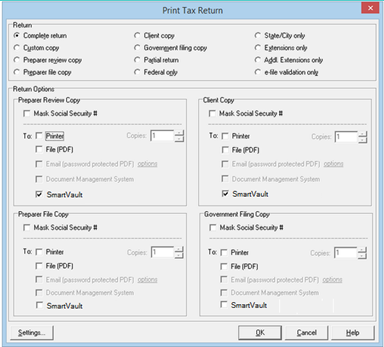 For example, the Print Tax Return window below shows the options enabled to print a Preparer Review Copy and a Client Copy as PDF files that are stored in SmartVault in their respective folders. SmartVault creates these folders for your client when you invite the client or print their tax return to SmartVault. 1. In Lacerte, select the client tax return to print. 2. Click the Print icon. 3. Enable the SmartVault checkbox for each type of return you want to print. Note: If the SmartVault checkbox is not available in your version of Lacerte, enable File (PDF) rather than SmartVault in the Print Tax Return window. 5. Select your SmartVault account, and then click OK. SmartVault notifies you when the PDFs have been uploaded and stored in SmartVault. When the printing is complete, you can sign in to the SmartVault client portal, open the Clients container, and drill down to the appropriate client vault to view the stored files. 1. In ProSeries, select the client tax return to print. 3. In the Printer section of the Print Selected Returns window, enable the SmartVault checkbox. 4. Select the copy types, such as Filing Copy and Client Copy, and then click Print. SmartVault uses a default folder structure template for each client based on their tax type in Lacerte. This template is used to set up each client in SmartVault when you import Lacerte tax clients into SmartVault. The template also specifies which folders your client contacts have access to and what level of access they have, such as Read Only or Full Access. For each tax year, SmartVault creates a TYxx folder under the Tax Files folder to store documents for tax engagements for that tax year. SmartVault creates specific folder for use by your clients. Each folder your client uses begins with "Client." By default, your client will have read-only access to all documents in these folder. Your client will have full access to the Client Source Documents folder so that client can upload W-2s, K-1s, and other documents as needed. Your clients will not see or have access to other folders when they log in to the client portal. SmartVault has internal rules to determine where to store printed documents from Lacerte. For example, the firm copy of tax returns are automatically stored in the Tax Returns folder for the associated client. SmartVault always knows the correct client associated with a printed document. However, if SmartVault does not have a rule for a specific document type, SmartVault stores that document in the Permanent folder. You can move files between folders once they are stored in SmartVault. To verify that SmartVault is your print target for PDFs, click the Settings button in the Print window.